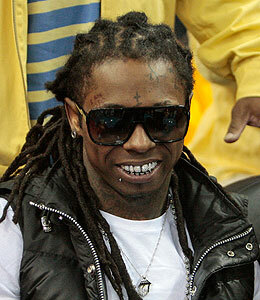 Rapper Lil Wayne has pleaded guilty to attempted weapon possession and faces a year in jail! The "Lollipop" singer faced a judge in New York today to answer to charges stemming from a 2007 incident in which a .40 caliber semi-automatic loaded gun was found on his tour bus. Wayne entered a plea of guilty for the charge of second-degree attempted weapon possession, which is a felony. When the judge warned the rapper that he couldn't withdraw his "guilty" plea, he responded, "I'm not one of those people." The 27-year-old Grammy winner is expected to receive a one-year jail sentence for the crime.